Here at AW Painting, we’re known for offering top-notch painting work, expert drywall repair, and one-of-a-kind customer service. Throughout our 40+ years in business, our free quotes, dependability, and high-quality services have made us a favorite of clients in and around the Fort Washington area. What you might not know, however, is that we also offer the best commercial pressure washing in Fort Washington. That’s right—as if our painting, drywall, and sandblasting services weren’t excellent enough, we’re proud to provide you with the opportunity to get your commercial building looking like new again. In addition to pressure-washing prior to painting or sandblasting, we also pressure-wash to provide aesthetic benefits to clients’ property. Let’s take a look at just a few of the many reasons you should let us pressure-wash your building! Over the course of months and years, an unseemly amount of dirt, grime, and dust become ingrained in buildings’ exterior portions. Besides making a building look old and worn, this dirt, grime, and dust can actually damage a building’s structural integrity by promoting cracking and wear. Our pressure-washing services will make your building look like new—or at least a lot closer to new than it did before! In all seriousness, non-pressure-washed buildings and pressure-washed buildings are like night and day, and your building will look exponentially more professional and welcoming when we’re finished. Besides that, there really is something to be said for aiding the long-term structural integrity of a building, and our services do that as well. Our sandblasting and painting services are most often preceded by pressure washing; if any residue is present on a surface that’s set to be sandblasted or painted, the quality of the job at hand will be dramatically reduced. 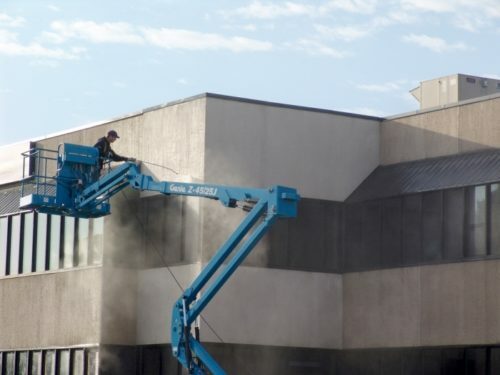 By consulting us to pressure-wash your building, you’re preparing it for any potential painting, sandblasting, and/or construction work that the near future might bring. The best part of the listed benefits and advantages of letting us take care of your pressure-washing needs is that they don’t cost much to enjoy. We’re committed to providing excellent work at reasonable prices. Consequently, you won’t need to break the bank to have your building looking like new. There’s never been a better time than today to experience the best commercial pressure washing Fort Washington has to offer. And we mean that—our Fort Washington commercial pressure washing clients can vouch for our dependability, reliability, and commitment to quality. Thanks for reading, and don’t hesitate to request a free estimate for our pressure-washing services; our customer service professionals can be reached at 215-608-0294!